Almost every reading passage on the TOEFL test will have a question about the main idea of a passage. Such a question may be worded in a variety of ways; you may, for example, be asked to identify the topic, subject, title, primary idea, or main idea. These questions are all really asking what primary point the author is trying to get across in the passage. Since TOEFL passages are generally written in a traditionally organized manner; it is not difficult to find the main idea by studying the topic sentence, which is most probably found at the beginning of a paragraph.If a passage consists of only one paragraph, you should study the beginning of that paragraph to determine the main idea. Basketball was invented in 1891 by a physical education instructor in Springfield, Massachusetts, by the name of James Naismith. Because of the terrible weather in winter, his physical education students were indoors rather than outdoors. They really did not like the idea of boring, repetitive exercises and preferred the excitement and challenge of a game. Naismith figured out a team sport that could be played indoors on agymnasium floor, that involved a lot of running, that kept all team members involved, and that did not allow the tackling andphysical contact of American-style football. The first sentence of this passage discusses the invention of basketball, so this is probably the topic. A quick check of the rest of the sentences in the passage con firms that the topic is in fact the beginnings of the sport of basketball. Now you should check each of the answers to determine which one comes closest to the topic that you have determined. Answer (A) mentions James Naismith but not basketball, so it is not the topic. Answer (B) is too general; it mentions sports but does not mention basketball. Answer (C) is also too general; it mentions physical education but does not mention basketball. The best answer is therefore answer (D); the origin of basketball means that the invention of basketball is going to be discussed. The following chart outlines the key information that you should remember about main idea questions. Study each of the passages, and choose the best answers to the questions that follow. In this exercise, each paragraph is followed by two main idea, topic, or title questions so that you can practice this type of question. On the TOE FL test, one passage would probably not have two such questions because they are so similar. Most of the ice on the Earth, close to 90 percent of it, is covering the surface of the continent Antarctica. It does not snow very much in Antarctica, but whatever snow does fall remains and grows deeper and deeper. In some areas of Antarctica, the ice has perhaps been around for as much as a million years and now is more than two miles deep. nontraditional naivete in their work. panoramic images of everyday life on the farm that have achieved international fame. 6. Which of the following best expresses the main idea of the passage? (A) Grandma Moses spent her life on a farm. (B) Art critics cannot come to any agreement on a definition of primitive art. (C) Grandma Moses is one type of primitive artist because of her lack of formal training. (D) Many artists receive little professional training. In the first half of the nineteenth century, a New York newspaper, the New York Sun, successfully carried out a hoax on the American public. Because of this trick, readership of the paper rose substantially. fooled by the story, even some prominent members of the scientific community. increased considerably as people eagerly searched out details of the new discoveries. instead, the company explained the moon stories as a type of literary satire. 7. Which of the following best states the topic of the passage? 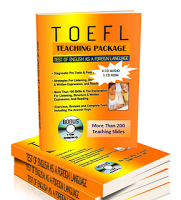 Download TOEFL Exercise 1, download here. To Get the book, click here.